Well, it looks like Amar’e might be out for the rest of the series after punching a fire extinguisher case. As if things couldn’t get worse. Now we might be trying to avoid the record for consecutive playoff losses AT THE GARDEN without one of our big guns. Of course he’s pissed, he only had nine shots. J.R. Smith had 11 and Melo took 26. Somebody is going to have to change the way this offense works. Either the coach or the GM. You can’t have one of the stars of the team punching things because he’s not getting enough shots in a playoff game. 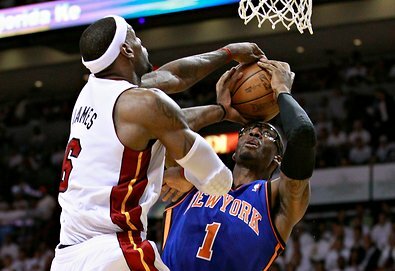 Amar’e has to know better too. He’s battled injuries his whole career. The last thing he should be doing is being reckless with his body. There’s only one thing that’s going to cheer me up after this.